A visit at Poás Volcano National Park takes 45 minutes – 5 minutes to present your entrance ticket (required advance purchase online), sign waivers, and queue up which is followed by a 10 minute walk on the paved path from the parking lot to the overlook, 20 minutes at the overlook, and 10 minutes walk back to the parking area in a group of up to 50 visitors and 6 guides. $15 for non-residents and ~ $1.50 for residents. 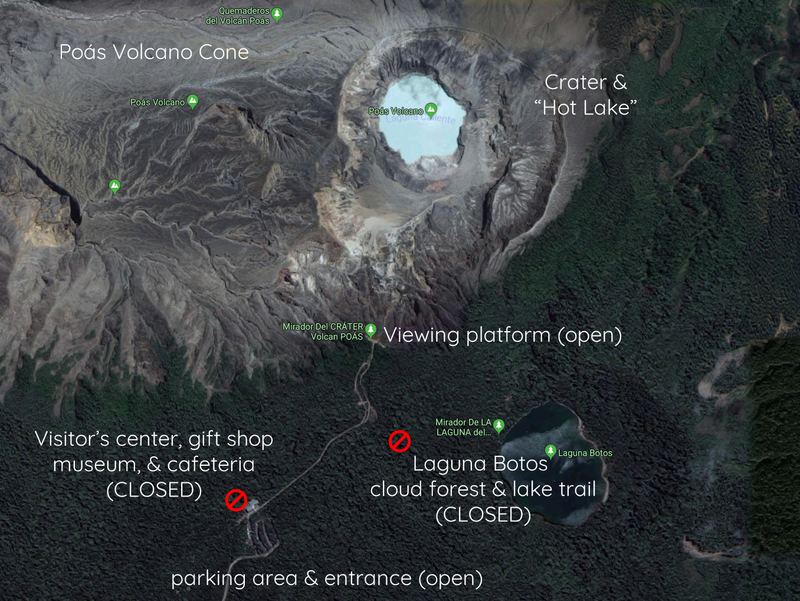 The crater overlook and path to the parking lot are currently open for visitors. We recommend visiting as early in the day as possible because the top of the volcano may be completely shrouded in clouds later in the morning. When clouds or mist obscure the crater there are NO refunds. You must begin your walk at the time printed on your ticket and are not allowed to wait for the clouds to clear. If you would like a second chance to see the crater you must purchase an additional ticket (subject to availability) and repeat the process. 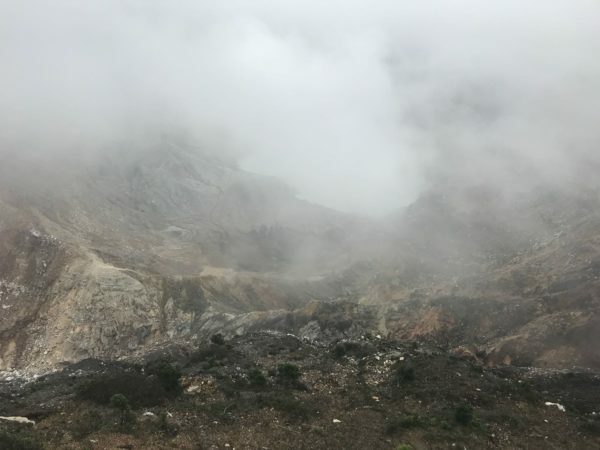 You can just make out the “Laguna Caliente” in the top center of this photo taken through the mist at about 10:00 a.m. the day Poás Volcano National Park re-opened to the public. – thanks to Paulien and Erik from the Netherlands! The National Park is scheduled to open from 7:00 a.m. until 2:00 p.m. every day (including weekends and holidays) and viewing groups depart every 20 minutes until 1:20 p.m. The entrance is less than 30 miles from San José on a paved road (see map and routes) but takes 1.5 hours to drive (plus up to an additional hour for traffic). The park service cautions against visits by children under 12, pregnant women, the “elderly”, and anyone with respiratory, cardiac issues or limited mobility. We recommend purchasing tickets at least a few days in advance – the government website is notoriously unreliable and may go down for a day or more at a time. There is no reliable public wi-fi or cell phone service at the entrance and no office for on the spot purchase. To purchase tickets please either use the unofficial instructions below or visit YouTube for the official reservation & ticketing instruction video (in Spanish). Take the Easy Way Instead -> many people choose to visit the crater as part of a full day tour of the cordillera central volcano region. Whether with a guide or on your own we highly recommend supporting the local family owned and operated farms, artisan workshops, restaurants, natural areas and other attractions not only because they suffered a year and a half of economic hardship while the park was closed but also because they are some of the highest quality and most interesting and beautiful in Costa Rica. Pacific Trade Winds is a high quality Costa Rica travel service that we recommend. 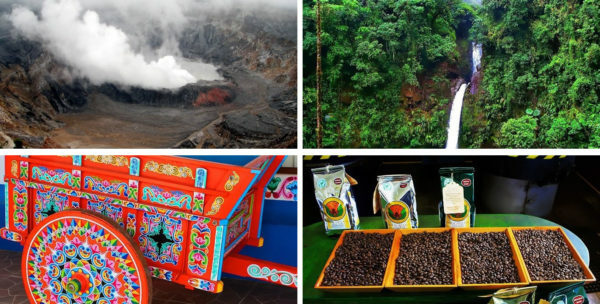 Their coffee plantation, waterfalls, frog pond, jungle cat rescue, butterfly, aviary and volcano tour includes transportation, breakfast, lunch and of course they take care of your Poás and other entrance tickets. Note: The online ticket system is very unreliable. We are not part of the government or park administration and have no control over the system. If you have problems you can contact the following. 2) Create a username/password, and enter your personal information. Be very careful entering your e-mail address. There is no registration confirmation required and if you make a mistake your tickets WILL be sent to the incorrect e-mail address. You may have to repeat the entire process and purchase new tickets. 3) Accept the “Terms and Conditions” and click the “To Register” button. You will be redirected to a login page to begin the reservation process. Please gather your information before attempting to purchase tickets – in step 11) you only have 8 minutes to enter the full names and passport/cedula number for every member of your party plus all of your credit card information. If the timer expires or you click “back” everything is erased and the form resets to step 1) forcing you to start over. 5) Under “Entry Date” select the day you would like to visit. Remember, dates are reversed compared to U.S. conventions so if you are visiting in March and have reservations for 7:30 a.m. 03/09/2019 you will have to wait six months to get in because 03/09/2019 is September 3rd. Adulto(a) No Residente – is anyone over the age of 13 who does not have a Costa Rican passport or cedula. Niño(a) No Residente – is anyone between 2 and 12 years of age who is not a Costa Rican resident or citizen. 8) The “Services” section of the form is extraneous – do not select any services, quantities or days. 9) Check to make sure that the total amount is correct. If it seems too low you may have forgotten to click a blue + and the tickets may not have been added to your order. If you click the back button to fix it all of your entries are erased and you have to start over. 11) In the “Facts Visitors” section enter the full name of each person you are purchasing a ticket for. Under “Identification” enter each persons passport number (Costa Rican citizens and residents use their government i.d. number). Click the blue + to add another person. Don’t forget to click the blue + after the last person. 12) In the “Pay Data” section enter the credit card information. “Id Number” is the cardholder’s passport/cedula number. 13) Click “Confirm” to purchase the tickets. 15) Print your tickets (images on phones are not currently accepted) and present them to the National Park Ranger in the parking lot 20 minutes prior to your reserved time. Simple enough ;-) Sign the waiver and enjoy your visit! Remember driving from anywhere in the central valley will take 1.5 hours (Alajuela) to 2 hours (San José, Escazú) plus an hour or more for traffic during rush hours. (see map and routes). 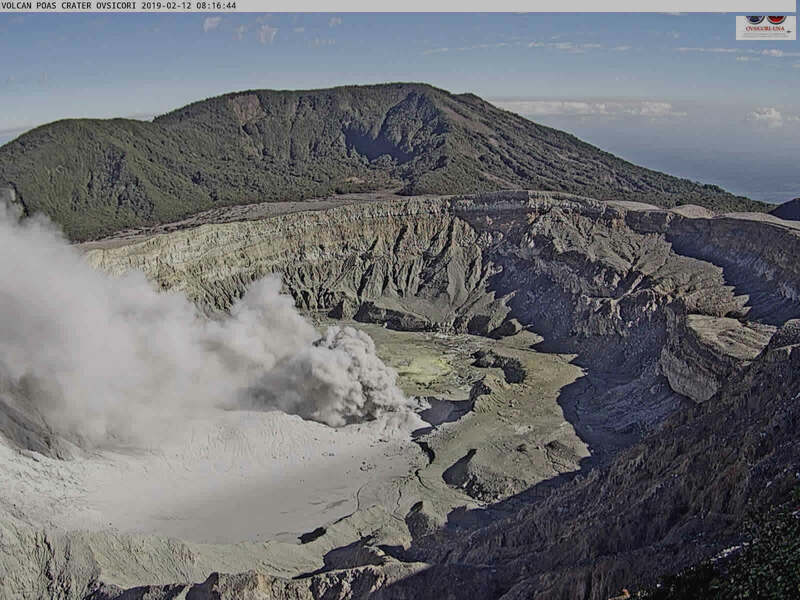 Feb 14, 2019 7:00 a.m. CST – After a two day temporary closure due to ash and gas emission Poás Volcano National Park is again open to visitors with reservations. Note: The online ticket system is very unreliable. We are not part of the government or park administration and have no control over the system. If you have problems you can contact the park or local tourism office. There is more visitor information (but no ticket purchase link or info) on the official National Parks Poás Volcano page. No refunds if you miss your appointed time. Restrooms are available but potable (drinking) water is not – please bring your own. The park is open from 7:00 a.m. until 2:00 p.m. every day including holidays BUT the last viewing group enters at 1:20 p.m.
Increase in the concentration of some gases of volcanic origin in the air such as Sulfur Dioxide, Sulfuric Acid, Hydrochloric Acid and Carbon Dioxide, that could be sudden or gradual, depending on the direction of the winds. In this case the impact on health manifests as: respiratory problems, conjunctivitis, allergies, asthma and when the concentrations are too high they could cause respiratory arrest and death. Fall of ash which is also associated with the direction of the winds. In this case the impact on health manifests as: respiratory problems, allergic rhinitis, sore throat, cough, asthma, conjunctivitis and skin irritation. Falling of larger particulate material (rocks of variable size from millimeters to centimeters), depending on the height of the eruptions and the direction of the winds, which can cause traumas mainly to the head, shoulders and back and even death by the fall and impact of those solidified fragments at high speed. The entrance to this sector under the current conditions is assumed by the person entering and SINAC is exempted from any responsibility. For entry into this area, the use of protective material is recommended, including: N95 type mask, safety glasses, long and thick fiber trousers and shirt, as well as carrying drinking water. Attach a copy of your passport (foreigners) identity card (citizens and residents).